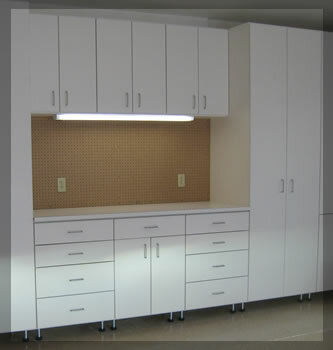 Whether you need a work bench area or a wall full of cabinets, custom garage cabinets are the answer. Cabinets are typically 16-24 inches deep and up to 96 inches tall but we can custom-size all dimensions at no extra charge. Garage storage systems are not only attractive, but your garage stays safe and clean. Closets Plus Inc. also carries a full line of sports and tool racks.